Union County’s volunteer Adopt-a-Trail Stewards help preserve miles of rustic trails that wind through County parks, like this one in the Watchung Reservation. 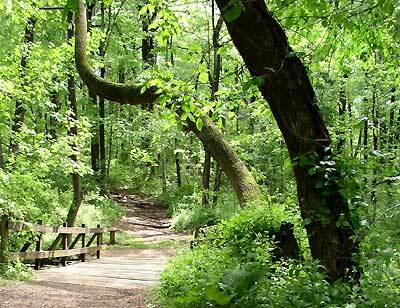 Union County, NJ — The Union County Board of Chosen Freeholders invites residents to join the Adopt-a-Trail volunteer program and help with trail conservation and preservation projects in Union County parks. Residents can find out more about the program and learn basic trail conservation skills by attending a beginner training session on Saturday, November 10 at the Trailside Nature & Science Center in Mountainside, from 8:30 a.m. until 10:15 a.m. The beginner session is free but pre-registration is required online at tinyurl.com/y8c6dcy7. Light refreshments will be served. At the training session, beginners will learn the basics of trail maintenance and stewardship, including how to read a trail map and follow a blazed trail. After the beginner session, current Adopt-a-Trail Stewards will hold their annual General Meeting. Beginners who would like to become Adopt-a-Trail Stewards must stay for this session, which begins at 10:30 a.m. and concludes at 1:15 p.m. The General Meeting will include updates on current trail projects and a presentation by Peter Dolan of the New York – New Jersey Trail Conference. Titled “Making and Maintaining Trails That Last,” the presentation will address the many factors involved in creating sustainable trails. All Adopt-a-Trail Stewards are required to attend an annual meeting, and commit to monitoring and maintaining their trail for a minimum of two years. Trail Stewards are also required to submit quarterly reports. Residents who cannot make a two-year commitment as Trail Stewards are welcome to join a scheduled Saturday Trail Work Day. Saturday Trail Work Days take place from 9:30 a.m. to 12:00 p.m., once a month from March to December, depending on weather. No experience is necessary. Saturday Trail Work projects are supervised by staff. The next two scheduled dates are Saturday, November 3 and Saturday, December 1. For more information about becoming an Adopt-a-Park Trail Steward, or to sign up for a Saturday Trail Work Day, email Betty Ann Kelly, Union County Department of Parks and Recreation, or call 908-789-3683.